When someone dies, what should you say to surviving loved ones about their legal status? … and … you’re still waiting, aren’t you? Get used to it, because I can’t think of a single thing it’s appropriate to say about the legal status of deceased loved ones — or their survivors. Broaching the subject will cause far more discomfort than a pregnant pause. All grief is personal, but please don’t impose personal comments on the newly bereaved. Unless the mourner asks you, or it pertains to your already established professional relationship, don’t bring up the bereaved person’s politics, religion, money, physical appearance, or legal status. Last week’s Supreme Court ruling on marriage equality reminded me I hadn’t yet posted about why legal status is a taboo topic if you want to console the bereaved. When your relative, friend, or colleague has lost a loved one, the only legal certification that should matter to you is the word deceased. Whether you’re a fundamentalist Christian preacher or the chief organizer of a pride parade or a number-crunching hospital administrator, whether the departed and their surviving loved ones are old or young, gay or straight, zealots or atheists, when you learn that someone died, your only concern should be to offer nonjudgmental consolation and comfort in any way you can. Do estranged surviving spouses suffer more distress than long-term partners who stood by loved ones in unwavering fidelity? Should one group have a say in making funeral and other arrangements while the other has no say? Does it matter to a mourning mother whether her child’s birth (and death) was connected to her by biology or by adoption? Does a father who truly fathered a stepchild (by day-to-day manning up to meet his kids’ emotional and physical needs — whether he legally adopted them as his own or not) grieve less fervently than one whose birth certificate – documented “fathering” was over and done with long before that child died? Do bereaved best friends (who talked twelve times a day) deserve less consolation and consideration than surviving siblings (who exchanged little more than annual Christmas and birthday cards)? Do legal residents mourn departed kin more than people without papers do? Do felons (or their families) deserve less respect and support when someone they love dies? 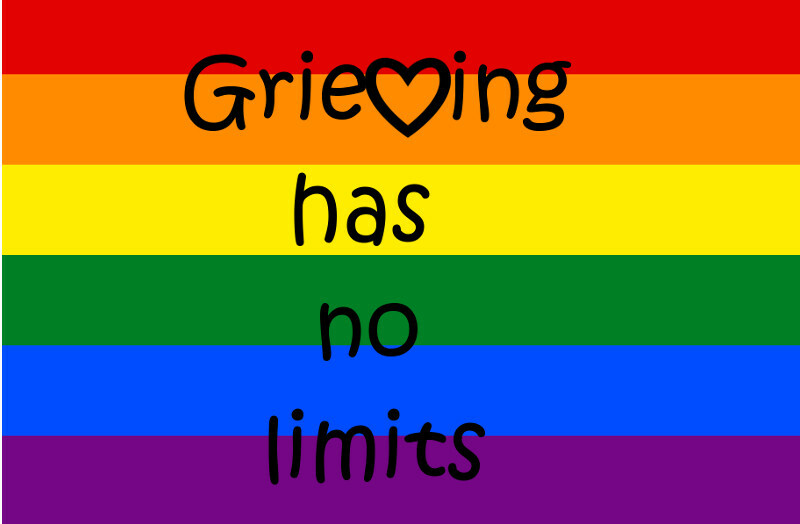 Grief is an outcropping of love. When death severs us from those we love, grief pours from the wound. Like love, it cannot be legislated into neat little boxes on government-issued forms. What can be, and should be, and now has been legislated, is greater ability for people to decide who will deal with the business and legal sides of their final goodbyes. Whatever the mourner’s legal status, whatever the legal definitions of relationships between people, it’s not up to anyone else to concern themselves with the details. For the rest of us, our job is to simply say “I’m sorry” and to show up without comment, bringing with us only our kindness — whether that’s demonstrated by casseroles, consolation, or (if appropriate) even cash. Quite appro in regards to the recent Supreme Court decision–whether we agree with it or not. And whether we like it or not, death is one thing that we ALL have in common. How much more Grief? Thanks for reminding us of that, Teresa.